Vancouver gives heroin to people suffering from addiction — and it works. VANCOUVER, British Columbia — The Providence Crosstown Clinic is decorated with posters espousing the sort of medical advice you might expect at any other doctor’s office: Cover your cough, wash your hands, don’t use antibiotics to treat the flu, and ask staff if you need any help. In the main treatment room, a familiar smell of rubbing alcohol lingers in the air — the kind of scent I associate with getting a vaccine shot. At Crosstown, the smell is the remnants of the medicine that 130 to 150 patients inject themselves with multiple times a day at the clinic. Except the injection here isn’t a vaccine. It’s medical-grade heroin. A clinic where patients use heroin may sound shocking and irresponsible, particularly now, as a deadly and devastating opioid epidemic ravages North America. But this approach is meant to treat the victims of that epidemic. The idea is this: If some people are going to use heroin no matter what, it’s better to give them a safe source of the stuff and a safe place to inject it, rather than letting them pick it up on the street — laced with who knows what — and possibly overdose without medical supervision. Patients can not only avoid death by overdose but otherwise go about their lives without stealing or committing other crimes to obtain heroin. And it isn’t some wild-eyed theory; the scientific research almost unanimously backs it up, and Crosstown’s own experience shows it can make a difference in the lives of people who use drugs. Crosstown represents an international move toward providing a full spectrum of care for people who are addicted to drugs. It isn’t a first-line defense against opioid addiction, and it’s not going to solve the crisis by itself. But for a fraction of people suffering from opioid addiction (maybe about 10 to 15 percent of them), other treatments won’t produce good results, almost certainly leading them to relapse — and possibly overdose and die. To combat this cycle, Crosstown offers opioid addiction patients medical-grade heroin (called “diacetylmorphine”). Under supervision, nurses are at the ready with the overdose antidote naloxone and oxygen tanks in case of an emergency. These patients are the people for whom other treatments have failed. It’s a last resort. And it works. Since 2011, the clinic has seen about 200 patients. None of them, MacDonald said, have died under the clinic’s supervision. In fact, as far as he can tell, no one has died at any prescription heroin facility due to an overdose — not in Canada, Switzerland, Germany, or the Netherlands. “So relatively safe,” I said. Heroin-assisted treatment has been used in the UK since 1926. But it’s gained more international attention in the past couple of decades thanks to Switzerland’s embrace of it in the 1990s. Twenty-one clinics there (and a prison program) now deploy the treatment. Due to the opioid epidemic, the approach is now getting more attention in the US — MacDonald even testified in front of Congress last year. But Crosstown is still the only clinic of its kind in North America. And despite its success, the concept of a full spectrum of addiction care, including heroin-assisted treatment, isn’t even close to reality in the US — which is experiencing its deadliest drug overdose crisis in history and which, report after report has found, often doesn’t offer even the bare minimum of addiction care. A clinic like Crosstown, though, provides a beacon for how the country can move forward as it tackles its opioid epidemic. A line of about a dozen patients quietly formed at the door to the injection room at Crosstown. One of them approached MacDonald as I stood to the side. “Thank you for saving my life,” he said. As MacDonald and I shuffled through patients to his office, I asked him how often this sort of thing happens. “Daily,” he said. Crosstown is run like a standard doctor’s office. Outside the injection room, clients patiently sit in waiting rooms, chatting about their families, getting and keeping a job, and, of course, their drug treatment. It’s a typical clinical setting, aside from the people injecting heroin just a few steps away. When it’s their turn, patients will line up, go into the injection room, get the drug prescribed to them, and inject it. The room is surrounded by mirrors that make it impossible to hide from your own image — and, helpfully for staff, make it hard for patients to do anything without getting caught, like smuggle drugs out of the room. When they’re done, the patients move on with their days — to the kind of school, work, and family that just about any other person can expect to have. The clinic has been open since 2011, residing in a downtown building that used to be a bank (as the old-timey vault in Crosstown’s basement shows). Although the concept of heroin-assisted treatment has been around for decades, the recent opioid crisis has led Canada — and particularly British Columbia — to step up the work, with Prime Minister Justin Trudeau enacting rules in 2016 to potentially expand the treatment. In 2015, the latest year with data, drug overdoses killed more than 52,000 people in the US, and more than 33,000 of those deaths were linked to opioids. The total drug overdoses dwarf car crashes (more than 38,000 deaths in 2015), gun deaths (more than 36,000 that year), and even HIV/AIDS at its peak (more than 43,000 in 1995). Canada and particularly Vancouver haven’t been spared. As I heard repeatedly while visiting the city in April, there were nearly 1,000 drug overdose deaths in British Columbia in 2016 — an unprecedented death toll in a province of around 4.7 million people. 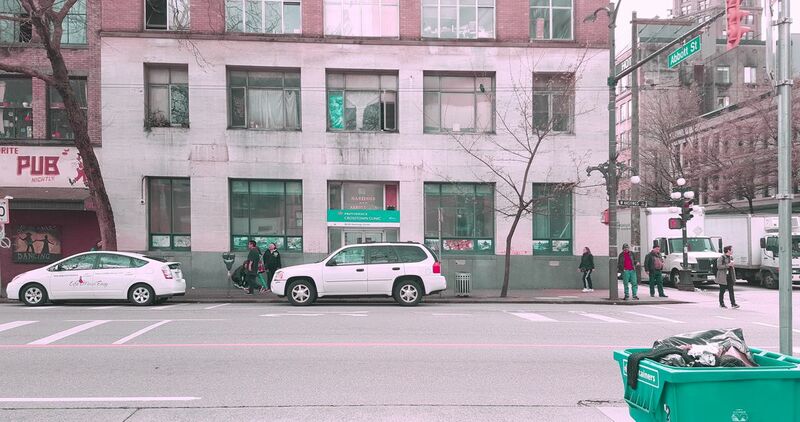 Vancouver’s city officials say the clinic is part of their comprehensive approach to the growing drug crisis. Even within the context of the opioid epidemic, recent events had made approaches like Crosstown’s more urgent. City officials estimate that more than 80 percent of the heroin bought in the streets is now contaminated with deadlier, more potent opioids like fentanyl and its analogs. On the street, someone might unknowingly shoot up these drugs, which their tolerance can’t handle, and overdose. But in a clinical setting like Crosstown, doctors and nurses can ensure the heroin they supply is not laced with these chemicals. Vancouver offers a glimpse at how this would work in North America. And so far, it’s working very well. One Crosstown patient, John Pinkney, can trace his drug use back to the age of 6, when he was first prescribed Ritalin. By his 20s, he was using heroin and other street drugs. Now in his late 50s, he says his life is in a much better place. He has a part-time job. He brags about owning a television and furniture — the kinds of things others might take for granted, but were hard-fought for someone struggling with drug addiction. None of this, he said, would be possible for him without the Crosstown Clinic. Pinkney laughed nervously as he retold his story. He was an orphan, passed around from home to home until at around 8 years old he ended up with “a middle-class, government family” in Edmonton, Canada. His mom was abusive — chasing him around the house, beating him, and at one point even threatening him with a knife. Around age 14, Pinkney ran away from home — “too much violence,” he said — and was cut off from his Ritalin prescription. Despite attempts to buy it off the street, the lack of a steady prescription, he said, made him feel like he was “missing something.” In his 20s, he filled that void with illicit substances like heroin. He eventually ended up in prison for several years, following a series of robberies for money to buy drugs. Pinkney heard of the Crosstown program a few years ago from his brother-in-law, who also uses heroin. Pinkney — along with his wife, who also used heroin — decided to check it out. It changed his life. This proved a massive change for Pinkney. Previously, he estimates he and his wife were spending $500 a day on drugs. To pay for that, his wife “worked the street,” and he, for some time, stole and scavenged trash cans and dumpsters (“binning”) for things to sell. 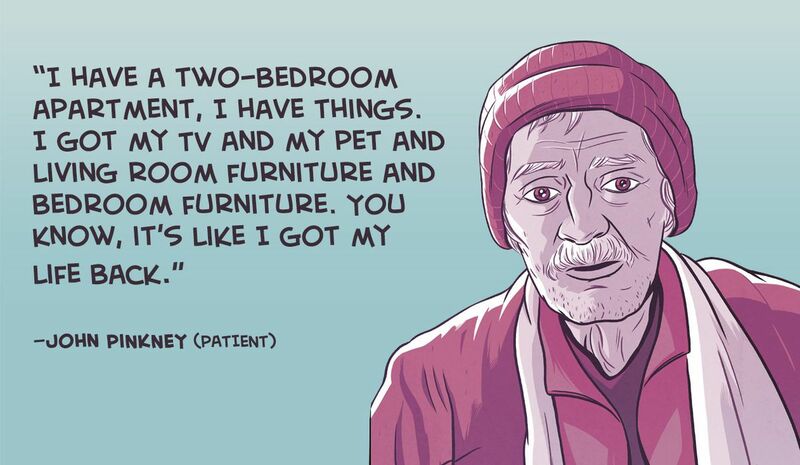 When they became patients at Crosstown — which is covered by government-provided insurance —they both were able to stop doing illegal or unsafe work to buy drugs. Pinkney now feels like his life is on track. He works a part-time job as a security guard at an apartment building, and he gets disability insurance. He also regularly talks to media about his experience, fashioning himself as an advocate for heroin-assisted treatment. Last year, he injected his prescription heroin in front of thousands of live viewers for the New York Times. Above all, though, Pinkney is proud that his life is fairly normal now. That doesn’t mean the treatment is easy. He comes to the clinic three times a day for heroin — in the morning, in the afternoon, and at night. This is typical: The drug’s effects wear off quickly, so patients often need to go back to it multiple times a day to avoid withdrawal. Yet even two or three visits a day may not be enough for some, so the clinic offers some patients a dose of methadone, an opioid often used in medication-assisted treatment, in their evening session so they can get through the night before their morning session. For Pinkney, this busy schedule isn’t too much of a burden. And even if it were, the alternative — going back to hustling for drugs that might be laced with more lethal chemicals — is worse. “When you look at the social consequences of that, it’s far superior going at this route than going the other route,” he said. Before starting heroin-assisted treatment, Pinkney tried Alcoholics Anonymous and Narcotics Anonymous. He tried Christian-based treatment centers. Even methadone didn’t work for him. So he continued using heroin, even while on methadone. After decades of struggles, Crosstown gave him a much-needed way out. The idea of treating opioid addiction with opioids isn’t new. For years, doctors have prescribed the opioids methadone and buprenorphine to get people off more dangerous opioids like heroin and traditional painkillers. When taken as prescribed, methadone and buprenorphine eliminate someone’s cravings for opioids and withdrawal symptoms — to help avoid relapse — without producing the kind of euphoric high that heroin or more traditional painkillers can. These drugs, used in medication-assisted treatment, are largely considered the best form of care for opioid addiction. The research on this point is, frankly, indisputable, with public health groups like the Centers for Disease Control and Prevention, the National Institute on Drug Abuse, and the World Health Organization all acknowledging methadone and buprenorphine’s medical value. Medication-assisted treatment doesn’t work for everyone, though; up to 40 percent of people addicted to opioids don’t respond well to methadone or buprenorphine. Pinkney complained of bone aches on methadone, while MacDonald noted that some patients feel symptoms such as nausea, headaches, and fatigue. For others, even high doses of these drugs are simply ineffective. For some of these patients, heroin-assisted treatment can help. Researchers credit the European programs with better health outcomes, reductions in drug-related crimes, and improvements in social functioning, such as stabilized housing and employment. Canadian studies also deemed prescription heroin effective for treating heavy heroin use. A review of the research — which included randomized controlled trials from Switzerland, the Netherlands, Spain, Germany, Canada, and the UK — reached similar conclusions, noting sharp drops in street heroin use among people in the treatment. In this trial, both diacetylmorphine [heroin] treatment and optimized methadone maintenance treatment resulted in high retention and response rates. Methadone, provided according to best-practice guidelines, should remain the treatment of choice for the majority of patients. However, there will continue to be a subgroup of patients who will not benefit even from optimized methadone maintenance. Prescribed, supervised use of diacetylmorphine appears to be a safe and effective adjunctive treatment for this severely affected population of patients who would otherwise remain outside the health care system. As the study notes, the treatment is typically available as a kind of second, third, or last resort — for patients who just haven’t had success with other kinds of care. The approach is not without detractors. The International Task Force on Strategic Drug Policy, for one, argues that programs like Vancouver’s “promote the false notion that there are safe or responsible ways to use drugs.” The group argues that this kind of program — and other harm reduction strategies — weakens the social stigma against drugs, leading more people to try and use these dangerous substances. But the danger here isn’t whether someone is using drugs; most Americans, after all, use caffeine or alcohol regularly throughout their lives with few problems. Drug use transforms into addiction, according to the definition provided by the Diagnostic and Statistical Manual of Mental Disorders, when using drugs begins hurting someone’s function — by, for example, leading them to steal or commit other crimes to obtain heroin, or, in the worst case scenario, death. The Providence Crosstown Clinic in Vancouver. Heroin-assisted treatment relieves this problem: It gives patients a safe place to get their heroin without resorting to bad behaviors. Still, experts and those involved in Crosstown emphasize it’s not a first-line treatment. 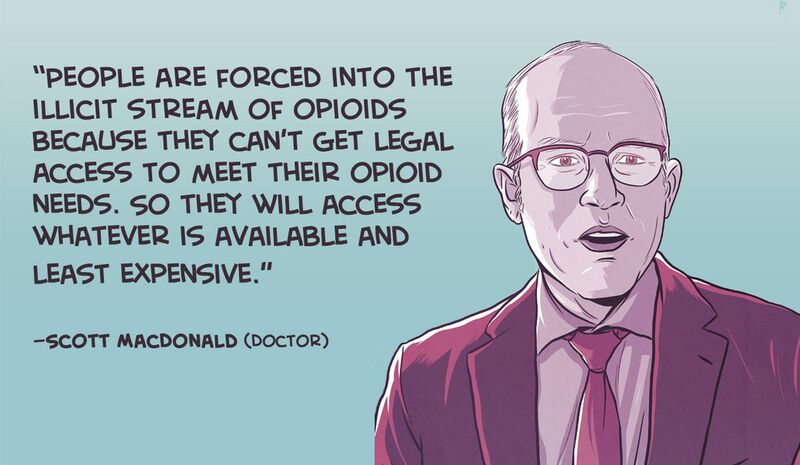 For instance, MacDonald said Health Canada, which covers the care provided at Crosstown for some patients, requires a laundry list of qualifications for coverage: 18 years or older, at least five years of opioid use, regular illicit opioid use in the past year, current use of illicit opioids, physical or psychological complications as a result of opioid use, and previous attempts to get drug treatment, particularly medication-assisted treatment like methadone or buprenorphine. So even if this treatment method spreads throughout North America, it’s never going to be a matter of just walking into the clinic and getting some heroin — as can happen at “medical” marijuana dispensaries in the US today. Also, clinics like Crosstown aren’t just about supplying heroin; they offer a chance to link people to other forms of aid, including social workers, other health care and treatments, and, potentially, a plan to wean people off opioids altogether — although some patients will use heroin for years or life. But there’s still so much we don’t know about how addiction works. We don’t even know why it afflicts some people but not others, and why some treatments work for certain individuals but not large segments of the population. In this environment, experts argue, it’s best to provide a spectrum of options that can help all sorts of different patients with various kinds of individualized problems. Yet while Canada considers expanding heroin-assisted treatment, the US isn’t able to meet the medical needs of as many as 90 percent of patients with drug use disorders, based on the surgeon general’s 2016 addiction report, due to the high costs and low supply of adequate addiction care. The treatment that does exist in America is often ineffective. Much of the focus in the US is on abstinence, which is potentially dangerous for opioids. If someone quits heroin cold turkey, they’re going to quickly lose the tolerance they developed over years of use. So if they relapse (which is expected in addiction medicine), they may overdose after they try the quantities of heroin they were used to before. 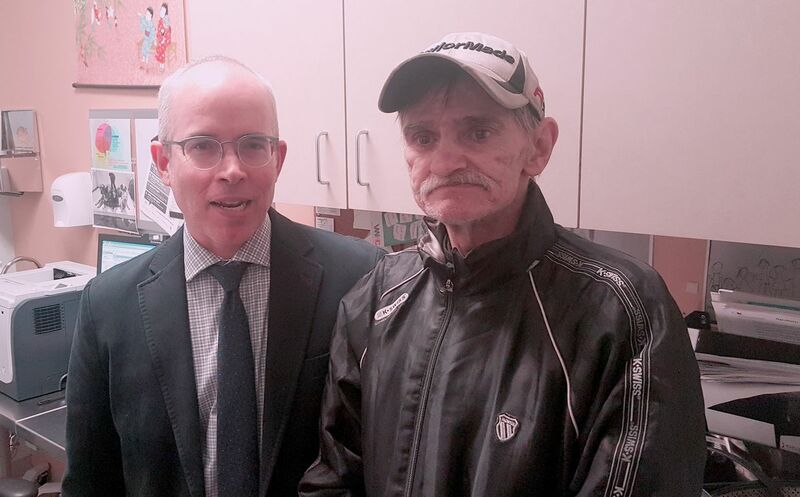 Dr. Scott MacDonald and patient John Pinkney at the Providence Crosstown Clinic in Vancouver. But groups like the Drug Free America Foundation (which did not respond to multiple requests for comment) say that abstinence is necessary, arguing that anything short of it is simply masking and even enabling dangerous drug use. Addiction experts disagree with this view, but it’s prevalent in the US — sometimes with deadly results. In the case of Lepolszki, methadone seemed key to saving his life. While this is one case, the idea that using methadone, buprenorphine, or other opioids for treatment is simply “replacing one drug with another” — without any consideration for the broader context of how the replacement drug is used — is a standard misconception in America. This won’t stop all drug overdose deaths. British Columbia is still suffering from a very bad opioid crisis, even though it already does many of the things that experts think the US health care system should do in response to drug addiction — from heroin-assisted treatment to medication-assisted therapy to other kinds of prevention and rehabilitation. But adopting an approach like Vancouver’s would, experts say, at least help greatly reduce the death toll. As the opioid epidemic surges, some US lawmakers are seriously looking at approaches like Vancouver’s. Ithaca, New York, Mayor Svante Myrick is pushing for supervised injection facilities and considering heroin-assisted treatment as part of his comprehensive plan to deal with the opioid epidemic.